Coconut oil is made up of a mixture of saturated, monounsaturated and polyunsaturated fats. The oil contains close to 12 g of saturated fat per tablespoon. This makes up nearly 60 percent of your daily recommended saturated fat intake. The American Heart Association states that intake of foods high in saturated fats should be limited. Saturated fat intake can raise cholesterol levels, leading to an increased risk of heart disease. While it is high in saturated fat, coconut oil also contains heart-healthy polyunsaturated and monounsaturated fats that are important for brain function and overall growth and development. Refined and unrefined types of coconut oil based on differences in coconut oil extraction. Refined coconut oil is extracted from coconuts that are baked first. The oil is then bleached to remove impurities. Some refined coconut oils contain partially hydrogenated fats, which are associated with cardiovascular disease. Unrefined coconut oil, also called "virgin" coconut oil, is extracted from fresh coconuts. This process maintains more of the anti-inflammatory and antioxidant benefits of the oil, making it a healthier choice. Based on data collected by the United States Department of Agriculture, 1 tbsp. of coconut oil provides 117 calories, 13.6 g fat, 0 g carbohydrates and 0 g protein. 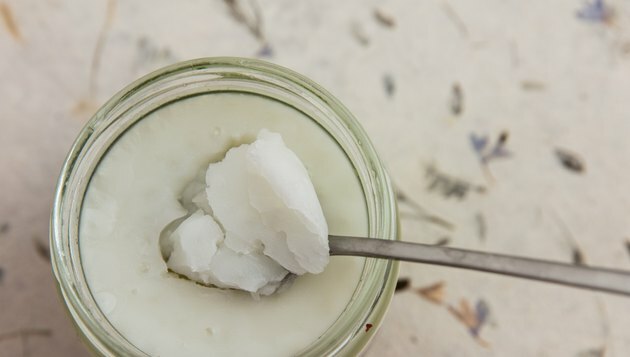 While the oil is liquid at room temperature, because it is high in saturated fats, coconut oil is nutritionally considered to be a solid fat. Coconut melting point is around 80 degrees Fahrenheit. Typically, oils contain a greater amount of monounsaturated and polyunsaturated fats. Coconut oil contains over 10 times more saturated than unsaturated fat. Coconut oil contains 11.7 g saturated fat. The saturated fat in coconut oil is made up of seven different types of fatty acids, including caproic, caprylic, capric, lauric, myristic, palmitic, and stearic acid. Of the seven types of acid, lauric acid is the most predominant. Coconut oil contains about 6 g of lauric acid, a type of medium-chain fatty acid. Eating foods high in medium-chain fats can cause an increase in low-density lipoprotein, or LDL, cholesterol levels. A tbsp. of coconut oil contains 0.789 g of monounsaturated fat. The monounsaturated fat in coconut oil is made entirely of oleic acid. A study by David Tin Win of Assumption University Bangkok, Thailand reported in 2005 that oleic acid is the main reason for the high anti-cancer benefits associated with the Mediterranean diet. He states that the components in oleic acid may help to offer added protection against breast cancer. Coconut oil contains 0.245 g of polyunsaturated fat per tablespoon. Linoleic acid is the only fatty acid that makes up the polyunsaturated fat content of coconut oil. Linoleic acid is considered to be an essential fatty acid. The body is unable to make essential fatty acids so it is important to get them from food in order for the body to function properly. Linoleic acid is an omega 6 fatty acid and is important for healthy brain function, skin and hair growth and bone health.